Ancient insects were able to cover themselves in dirt, wood and sand to sneak up on prey and hide from predators. There are many animals that change their skin to their surroundings in order to save themselves from predators. However, ancients insects found fossilized in amber had taken it one step further according to new research. Researchers from the Chinese Academy of Sciences in Nanjing, found insects were not only changing according to surroundings but actually hide themselves using dirt, leaves, sand and wood. In some cases, exoskeletons of other insects were used as camouflage. 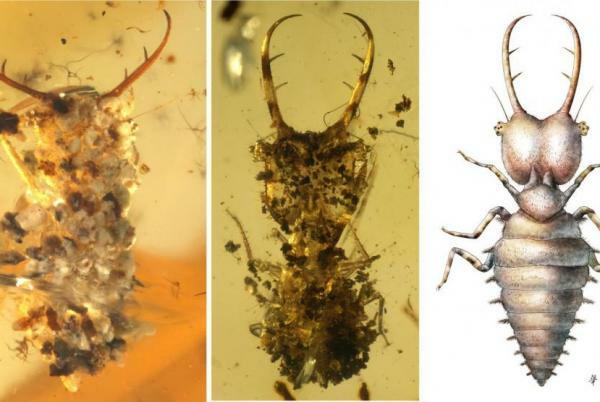 Lead researcher Bo Wang and his team discovered this amazing ability in three groups of insects; chrysopidae (green lacewings), myrmeleontoid (split-footed lacewings and owlflies), and reduviidae (assassin bugs) after researching more than 300,000 ancient amber samples from all areas of the world. One particular bit of amber from Spain showed a green lacewing preserved in mid camouflage. The insects showed they used this complex behavior for nearly 100 million years with only a handful of modern insects today using similar but less complex ways of camouflage. Wang and his colleagues don’t know why this is not so common in today’s arthropods.